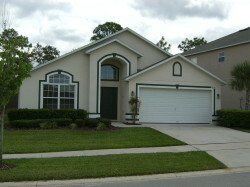 Come and enjoy YOUR home while vacationing in Orlando Florida! 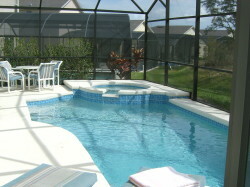 Experience the comforts of home while you vacation in the hottest area of Florida. "Everyday is a vacation" is nestled in the exclusive Emerald Island Resort, less than 3.5 miles from Walt Disney World in Kissimmee, Florida. With 4 bedrooms and 3 bathrooms, this elegant vacation home is perfect for family groups, sleeping up to 8 guests. 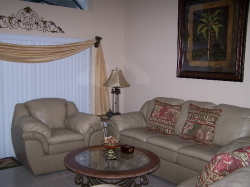 "Everyday is a vacation" has a formal living room to relax in peace in during the day or evening, with comfortable furnishings, sumptuous sofa and love-seat. There's also a separate family room overlooking the sparkling pool deck, that also enjoys sofa and love-seat, plus cable TV. Outside, there's a super, electrically heated, screened, sparkling-clear pool and bubbling spa pool- where you and your family can splash around, laze out in the warm Florida sunshine. Sleeping accommodation at "Everyday is a vacation" includes a master bedroom suite with a King-size bed, telephone, clock/radio, dresser, nightstands with lamps, and a master bathroom with large walk-in closet, walk-in shower, roman tub and twin vanity basins. 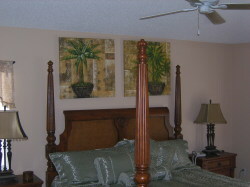 There's a second master bedroom with a Queen-size bed, nightstand, clock/radio, dresser. A second full bath is adjacent to this bedroom. There are 2 further bedrooms, both perfect for the children providing 2 twin beds in each. A 3rd bathroom adjoins the 4th bedroom. The kitchen has been fully equipped with everything that you could need for a quick family snack, or that special meal for loved ones. Choose to eat at the informal breakfast area, or in the (only slightly more formal!) dining area in the separate living room in the front of the villa. The Emerald Island Resort offers an array of complimentary amenities, which are available to guests. The 4,000 square foot club house has fitness center, sauna, computer access to the Internet, heated community pool and spa pool, Video games room, together with a children's play area and Tikki Hut, and is the perfect place to get to know other families. The Clubhouse is very near a trail for walking, jogging or biking that winds through the community's natural woodland setting. Why pay those expensive hotel rates when you can receive all the amenities a home can provide at a lower cost? You can't beat the price! You will have the best time of your life! Remember... Our home is your home!